With the development of infrastructure, urbanization construction, the repair of roads and bridges, natural sand and gravel gradually reduced. It has been unable to meet the needs of infrastructure. Natural resource cycle is relatively long, so research and development the resource to replace natural sand is being a project by the construction industry. At present, after investigation, in addition to natural sand, there are many ore can be processed to building sand. General materials are river gravel, pebbles, basalt, granite, limestone, slag and so on. Due to river pebble has compression, wear resistance, corrosion resistance, is a most suitable green building sand. 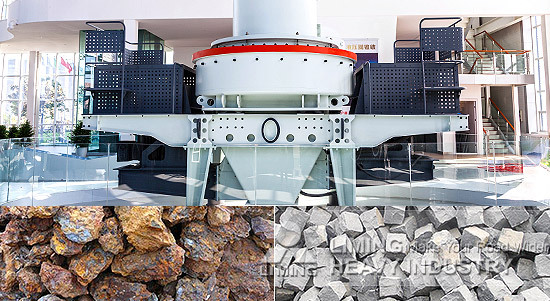 Liming Heavy Industry is specializing in the production of ore crushing series for decades. They introduced Germany advanced technology, researched and developed VSI5X sand making machine, it can be configured jaw crusher and cone crusher. The maximum feed size can be 1200mm, the output size can be aggregate gravel, coarse sand, fine sand and special fine sand. VSI5X sand making machine has simple structure, easy operation, small footprint, easy installation and maintenance, energy saving, provide green building materials for the construction of infrastructure.